Oh boy. Plan? You've already got you tickets to induction ceremony purchased right? 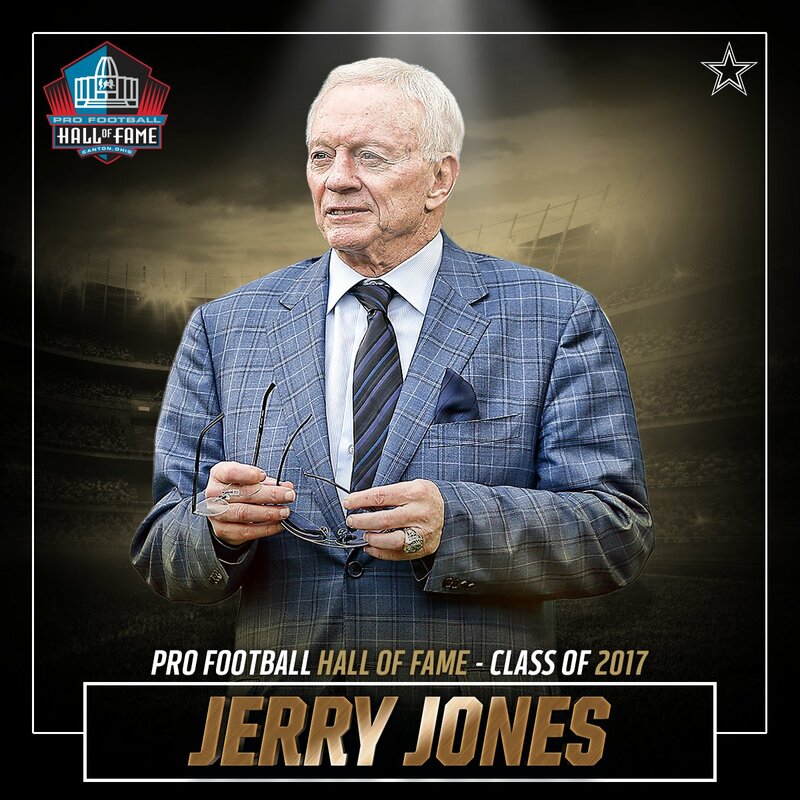 The Class of 2017 consists of kicker Morten Andersen; running back Terrell Davis; safety Kenny Easley; owner, president and general manager Jerry Jones; defensive end Jason Taylor; running back LaDainian Tomlinson; and quarterback Kurt Warner. Love him or hate him..TO probably should have gotten in. It's not right in the long run, but take away the mouth, he probably does. TO should have been in over Davis. I would agree with this 100%. Davis was great for 3 seasons. TO a decade. Was JJ's picture taken before his plastic surgeries? T Owens definitely deserves to be in over Davis IMO. I'd sooner drop dead than go to worst state in the country to see the man whom I hate the most in the entire NFL. TO (2nd) all-time receiving yards. The argument that I've heard against TO is that three teams dropped or traded him when he was still a productive player. That, combined with 0 Superbowl wins, can convince some voters that he was not as valuable to his teams as his stats suggest. I'm glad TD got in and TO did not. Stats only tell half the story. I mean... if Matthew Stanford plays long enough, the dude will have other worldly stats compared to other HOF QBs. But, he's not a HOFer. There's something more to HOF than stats. The bottom line is that TO literally divided teams more than any player in NFL history then he wasn't good enough to matter after that. He epitomizes "me first" players. At the end of the day, football is a team sport and TO lacked the ream concept throughout his career. TO wanted stats. He got them. That's his legacy. If he wanted HOF... he needed to be better teammate. I'm sure he'll eventually get it. I just hope that it's not for a long time. One of the dumbest single posts I've read in quite a while. Here's an interested stat about T.O. and his teams. I haven't fact checked it, but I saw this on Twitter so take it for what it's worth. Say what you want about him being a cancer, but he helped his teams win games. For a WR to impact his team to that degree, it takes a special talent. T.O. is a top 3-5 all time WR, whether you liked his personality or not. T.O. not being in the HOF is a f'n joke. He's better than Marvin Harrison, Chris Carter, Tim Brown, Michael Irvin, and pretty much everyone else not named Jerry Rice. 4. (Julio, AB making a case if they continue a few more years at their current levels. EL ramster on the sig!